We are eight days away from seeing the newest games from BetSoft. The gaming provider announced they will release the new Reels of Wealth slot on April 28th. The new slot game is a 3D video slot coming from the provider’s Slots3 collection. Games from this series feature vivid colours, 3D cinematic graphics, and smooth animations. With this in mind, we don’t expect Reels of Wealth to be anything but perfect and most importantly, fun. 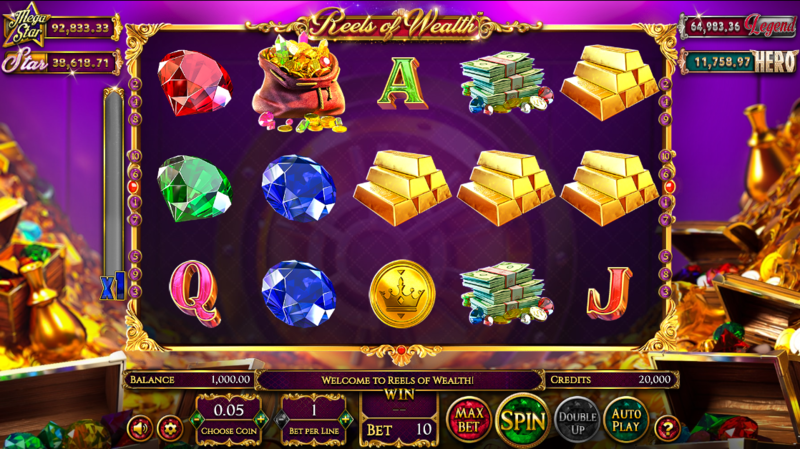 The Reels of Wealth is a slot game with ten paylines across five reels. The slot pays from the centre out, left to right, and right to left. The Reels of Wealth has three exciting features – Megastar jackpots, Rolling Wins with a multiplier, and wild multipliers. So, let’s start with free re-spins and Rolling Wins with a multiplier. Every time a player wins the game, they also get one free re-spin. After several wins, players can activate the Rolling Wins feature. After three wins in a row, players’ winnings are doubled with a 2x multiplier. If a player is on a roll and wins six re-spins, the Rolling Wins multiplier increases the initial winning amount three times. Next on our list are wild multipliers. In the Reels of Wealth slot, the wild symbols appear on the second and fourth reel. Apart from replacing every symbol except for scatters and megastars, wilds come with a multiplying feature as well. Landing a single wild symbol doubles your winnings, while two wilds multiply your regular winnings four times. The Megastar jackpot mini-game might be the most exciting feature of the new slot. To activate the mini-game, players should land three or more Megastar symbols. With three of those symbols on the reels, players get a chance to win big at one of the four progressive jackpots. Free spins are also part of the package, rewarding players with 10, 15, and 25 free spins for three, four, and five Megastar symbols respectively. Plus, the game features high paying symbols such as green and red diamonds, and treasure chests. Furthermore, if you get five of a kind, and with green diamonds, you’ll receive 75x your winnings. Red diamonds will increase your winnings 100x, and with five treasure chests, you’ll get as much as 250x your initial winnings. The Reels of Wealth is days away from its release. We expect the best UK PayPal casinos to be the first ones to add this BetSoft slot to their game inventory.